Began reconfiguration of the Cable TV van to better accommodate more volunteers, including separate areas for a producer, instant replay, and graphics. PTCT Volunteers record 86 programs in May, which is the most recorded in a single month in the station’s history! Peters Township Community Television began a refresh of all of the station’s studio sets, including reorganization of the space, and the purchase of new set furniture (sofa, chairs, desks). Cameras in Council Chambers are replaced with new high-definition cameras, including the 13-year-old overhead camera that shows plans and other items to the projector in the room. Also, the agenda items appear as on-screen graphics to help viewers follow along. This equipment and the new graphics makes their debut at the July 9 Planning Commission meeting. Agenda item graphics appear for the first time! There were 83 programs recorded in October, which was an all-time monthly record!! Joan Kaylor debuts her newest show, "Tapping with Joan"
"Highway and Hedges Outreach Ministries Show" is seen for the first time on PTCT. "The Scoop on Pilates" changes its name to "Skinny Jeans Pilates"
"Last Word in Sports" is offically renamed "Last Word in Sports with Dale Lolley"
Linda Vaira becomes the host of "Chamber Focus"
The Sony DSR-250 makes its debut with the recording of the PTHS Play, "Gone with the Breeze"
PTCT records its first show directly to DVD, "Last Word in Sports"
"The Family Wellness Show" debuts, as the "PT Park & Rec Update"
A crew from HBO Family Channel arrives at PTHS to tape a behind-the-scenes look at the making of "Probable Consequences"
Dr. Eugene Hammell takes over as the host of "Ask the Doctor"
Dr. Hammell takes over the hosting duties on "Ask the Doctor"
Sandee Umbach becomes the new host of "Ask the Doctor"
A 2nd Hi-8 Camcorder (Sony EVW-3001) is purchased. "Judie -30-" makes it to the finals of the Hometown Video Festival, sponsored by the Alliance for Community Festival in California. "PT Magazine" becomes "South Hills Magazine"
Debbie Kirtz is hired as the Video Production Coordinator for Peters Township Community Television. Glenn Ward is also hired as the station's first Video Productions Technician (he is also employed by Upper St. Clair in the same capacity. Peters Township Community Television purchases a van to store and haul equipment to shooting locations. The Board makes a request to Council to expand the Cable TV Board to 5 members. Marilyn Tatusko becomes the station's third Video Production Coordinator. Kim Bidorini is hired by the Peters Township School District to teach brand new courses, called Media I and Media II. These classes were an expansion of the previous Student Publications I & II courses (which produced the school newspaper "Smoke Signals". The new classes continued producing the school paper, as well as the production of video programs for Peters Township Community Television. The Board discusses a large number of programs that are in the works: Council meetings, Arrowhead Trail, Elementary School Magazine, Folk Music with Walter Scott, Firework Safety, Recycling Tape, West Penn Tennis Tournament, Family Medicine and Family Dentistry, Township Manager's Forum, Tennis Instruction, House Tour, Cooking with Luis, and Community Day Promotion. Ms. Hennig would soon be getting an office located in Room 225 at the High School in the fall. The Board discussed the creation of the Video Productions Technician position. A Service Club at the High School is discussed by the Board and is set to go into service in the fall (eventually renamed the PTHS Video Club.). The first Video Production Class is discussed, which will be taught by Jim Riding, Paul Sutherland and B. Nickles and cost $25, with registration and publicity to be arranged by Joanne Nelson of the Recreation Department. It will be offered in January 1989, with an advanced class to follow. Peters Township signs a franchise renewal agreement with Adelphia for an additional 15 years on October 24. Part of this agreement results in the creation of Channel 20 (a local origination studio facility to be used by the communities of Upper St. Clair, Bethel Park, Mt. Lebanon, and Peters Township. In addition, the Township is granted its own separate Public Access, Educational Access, and Government Access channels. Adelphia gives Peters Township an equipment grant of $75,000 (over 5 payments) for the purchase of equipment for the Township Public Access channels, as part of its agreement. Basic Cable Channels offered on Adelphia as part of the agreement include: WPCB, WQEX, KDKA, WTAE, WPXI, WQED, WTRF, WPTT, WPGH, WTOV, Public Access Channel, Education Access, Government Access, Local Origination, WTBS Atlanta, WWOR New York, CBN Cable Network, ESPN, Lifetime, Cable News Network (CNN), Financial News Network II, Cable Headline News, C-Span, The Weather Channel, MTV, Nashville Netowrk, KBL Entertainment, USA, Arts, Culture and Entertainment, Nickelodeon, Meadows Racing Network, and QVC. In addition, Home Box Office (HBO) and Disney Channel are offered as Premium Programming Services. Canonsburg General Hospital begins its decades-long relationship with Peters Township Cable TV, by supplying the station with 7 programs to air on the station, the first of these "Seven Warning Signs of Cancer" with Robert Lesnock, M.D. is shown for the first time on Nov. 30. Additional programs include "Lung Cancer", "Understanding Breast Cancer", "CGH's Coping & Caring Support Group" & "Colorectal Cancer"
Bethel Park backs out of the proposed South Hills Consortium and it is believed that this is the end of the idea of forming this Consortium. The Board approves the purchase of a character generator, the Texscan SpectraGen IV B with a WeatherView Package for around $7,650 and it goes into service in May. Ron DeGrange and new PTSD Superintendent Dr. Dennis Urso ask about broadcasting the High School Graduation Ceremonies live. Dr. Urso also requests more information on how the Board can assist in putting a group together to do productions of school sponsored activities. PTHS Graduation ceremonies are broadcast live with the help of Adelphia. At the Board meeting, Arlan Stehney suggests getting help from Adelphia to attempt to broadcast football games and other activities in the fall. Plans are made to run a cable to the High School football field and to install a modulator in the auditorium projection room, which was completed the following month. Adelphia assists in the first 2 recordings of PTHS Football on Oct. 24 (Homecoming) and Oct. 31 (Senior Rec). Rick Stellfox served as commentator and Mike Silvestri and Mike McLaughlin were the camera operators. Bids go out for the purchase of equipment including 2 cameras, special effects generator, remote control units for the cameras, cables AC adapters, monitors, and tripods. After successful recordings of football games, the Board now turns its attention to what to record next. Suggestions include: basketball, the High School Christmas play ("The Sleigh Ride Express"), wrestling, and the tree lighting ceremony. PT Recreation Director Joanne Nelson works to make a series of programs produced by the Pennsylvania Area Agency on Aging available on Channel 7, including "Stay Healthy and Alive", "Mental Well Being", and "Crime and the Elderly". Westminster Magazine (5:00 p.m.), South Hills Assembly of God (6:00 p.m.) and South Hills Aglow (7:00 p.m.) make up the programming schedule on Peters Township Cable TV on Wednesdays. On Mondays, Channel 7 shows 2 programs "The Nature Series" and "The Money Program", bringing the station's complement of regularly recurring programs up to 5. South Hills TV Cable Company, Inc. changes its name to Adelphia Cable Communications. Ron Barckhoff replaces Fran Bradley as General Manager. Chuck Redpath becomes South Hills TV Cable Chief Electronics Technician. Arlan Stehney is appointed to the Cable TV Board. The Board grants preliminary approval on the operating rules for Public Access Television within Peters Township. Our first Policy Manual is about to be born! South Hills TV Cable transfers all cable lines and relocates all equipment to the new Cable TV Room. As plans for the demolition of the old Peters Township Middle School move ahead, the Board discusses the possibility of locating a community studio in the new Middle School building because of the lack of space in the High School. The Peters Township Cable TV Board solicits bids for the purchase of a portable 1-piece ENG/EFP camera system, a VHS Editing System, and a tripod/dolly with the options to buy additional equipment and choosing either a JVC 1/2" system or a Sony 3/4" U-Matic system. While the bids are out, Peters Township begins discussions with the other local municipalities (Upper St. Clair, Bethel Park and Mt. Lebanon) to discuss possible joint ventures in production and equipment sharing in a South Hills Consortium. So, the Board decides to reject all bids, while it waits for further discussion. The cameras that ALMOST WERE! Adelphia looks to add Pennarama video service to Channel 7 to supplement local programming. The Board approves the request to be shown daily from 12-4 and 8-12. 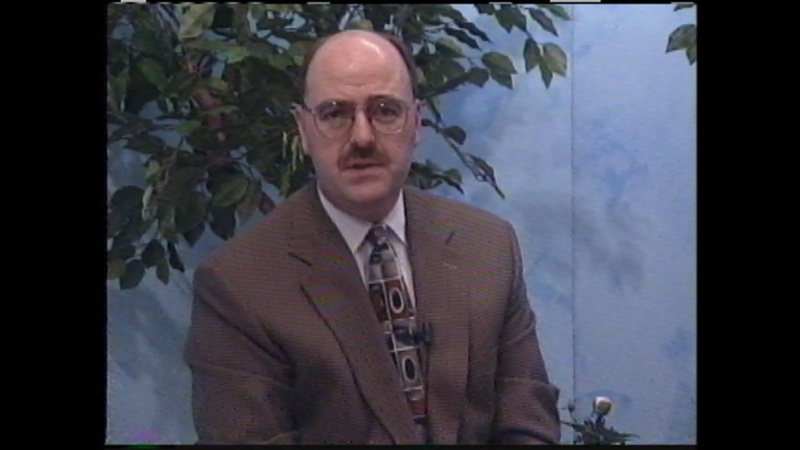 Pennarama was the main content provider for PECS (Pennsylvania Educational Communications System), which would eventually be renamed the Pennsylvania Cable Network (PCN). Peters Township Cable Television Channel 7 officially has a set of Operating Rules for Public Access Cablevision, as approved by Council on Nov. 25. Adelphia begins construction on its news office and studio facility to be located on Enterprise Boulevard in Bethel Park. A monitor is installed in the Peters Township Public Library which shows the Township channel. Public Communications Channel moves to Channel 7! Fran Bradley of the South Hills Cable TV Company makes a suggestion to the Board that a course in television should be introduced into the high school curriculum, and if a great deal of interest is shows perhaps a club could be formed. This is the first mention that we have found of what would eventually become the PTHS Video Club and the Media Department at the High School! Expanded Basic Cable comes to Peters Township with the addition of ESPN, CNN, USA, MTV, Nickelodeon/ARTS, CHN (Cable Health Network), WTBS, and a broadcast channel in Wheeling in a 19-channel package available for $8.50 per month for the first TV set. In addition, viewers would receive the premium channels Cinemax and The Movie Channel as part of the package at no extra cost. The Township's Message Channel and programming is relocated to Channel 23. Representatives from Trinity Methodist Church meet with the Peters Township Cable TV Board to discuss their intentions to produce a weekly half-hour program (including community interests, continuing education program for the Church, a short Bible study and short Pastoral segment) with their own equipment onto 3/4" tape and have it air on Channel 2. The first locally produced program, a Peters Township School Band Concert, is recorded on March 26, 1981 at the High School and is broadcast on Channel 2 for the first time on March 28, 1981 at 11:00 a.m.. In addition, publicity for this recording are sent to The Advertister, Observer-Reporter, Pittsburgh Press South, Post Gazette South, and 3 radio stations (WTAE, WWSW, KQV). Adelphia completes installation of cable lines in Peters Township, so now all residents of Peters Township has access to the service. Fran Bradley becomes the new contact person for Peters Township with the South Hills TV Cable Company. Robert McMurray (Board Secretary), James A. Ross (Township Manager), and Anthony W. Accamando, Jr. (Manager, South Hills T.V. Cable Company). including the wiring of the school buildings. Peters Township signs its first cable franchise agreement (a 15-year agreement) with Adelphia Cablevision, Inc on April 5, 1976. After 18 months of research and work, the Peters Township Cable TV Study Group recommends to the Peters Township Board of Supervisors that Adelphia Communications be allowed to offer cable TV service in Peters Township. The Peters Township Cable TV Study Group was chaired by George Frazier and also had the following members serve on the committee: John Bullock, Dr. Howard Jack, Jack Morgan, Donald Musson, Dusty Rhodes, Joyce Schaeffer, George Thornburg, Walt Winnowski, and Paul Linder.